Being an expat is demanding, especially for a trailing spouse who must abandon his or her professional life to follow their partner to an assignment abroad. Often as a result of leaving behind work or career, the accompanying spouse suffers the loss of self-confidence, self-esteem and sense of identity,leaving the door open for depression and stress. 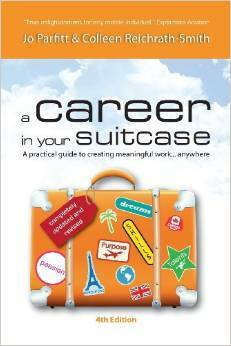 A Career in Your Suitcase by Jo Parfitt and Colleen Reichrath-Smith offers inspiration and guidance to expat spouses weathering major career changes. The authors discuss their own experiences and adventures as accompanying spouses, subsequently sharing their method of developing their own new portable careers with the reader. Parfitt and Reichrath-Smith define a portable career as “work that you can take with you wherever you go.” Further they explain that a person’s portable career must be based on the individual’s “own unique set of skills, values, passions and vision and not based in a physical location.” They reassure accompanying spouses, both men and women, that a successful and enriching portable career is possible for anyone. The book includes poignant stories and quotes from accompanying spouses around the world about the many struggles and discoveries endured when looking for a satisfying career. These anecdotes are supported by the author’s personal stories. They touch the heart and soul by encouraging the reader that they are not alone on the journey to finding a new career. A Career in Your Suitcase offers ideas and thoughts on how to remain flexible and fluid when moving from one foreign post to another. While it may not be possible to keep your current career or job, the authors offer advice on how to recycle and reuse the skills you already have to create a new portable career. In addition, the book makes use of exercises and activities to guide you through the process. The exercises enable you to reach deep into your subconscious mind to identify and evaluate your own skills, values and passions. This process is a crucial step in establishing a new career. Each chapter ends with a generous list of additional resources for further assistance on your journey. A Career in Your Suitcase is highly recommended as an essential tool for expat spouses (or anyone seeking creative career-forming ideas) wanting to establish a new portable career.